Ever wonder what a “gizzard” is, and why birds have them but people don’t? You’re not alone. 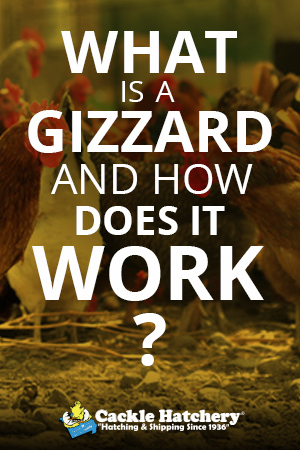 Chances are you’ve heard about gizzards before, but you may not know why your chickens need these specialized organs! In fact, a gizzard is an essential part of the chicken’s digestion system. Chickens peck at their food with their beaks, and whatever they manage to capture mixes with saliva and other digestive enzymes as it travels down their esophagus. Because they don’t have teeth, however, the pieces of food they eat often remain relatively large. From the esophagus, the food moves into the crop, which is an area in the base of the chicken’s neck where food can sit for up to twelve hours before digestion continues. 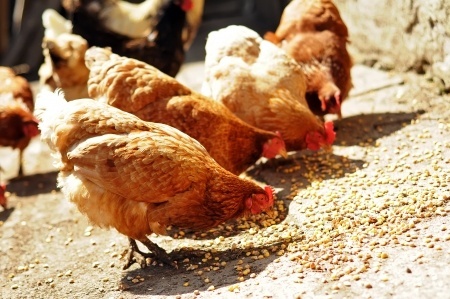 After sitting in the crop for a while, food trickles slowly into the gizzard, where muscles and small, hard particles like pebbles or sand, in conjunction with more digestive enzymes, grind up the chicken’s food into digestible particles. In essence, the action of the gizzard acts as a replacement for chewing with teeth. From the gizzard, the broken-down food passes through the small intestine, where the chicken’s body absorbs valuable nutrients. Then, bacteria in the ceca, a sack along the wall of the lower intestine, breaks down the remaining food and moves it into the large intestine, where it’s dried out and turned into waste. The coolest part about the gizzard is that it actually uses pebbles, grit or sand that the chicken has ingested to aid in the digestive process. The next time your chickens are pecking their way through a meal, think about all of the different organs that play a part in their digestion. In some ways, the process is a whole lot more complex than our own digestive systems! Stay tuned for more updates from the Cackle Coop! ← When Will My Hen Start Laying Eggs?